One of my favorite films of all time. I just wish they could have made a sequel to cover what i've heard is the rest of the book, that's not covered in the film at all. The hallway mirror scene is one of the most classic, and excellent scenes i've ever seen. 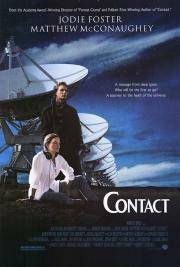 Although Contact begins with a lot of promise and intrigue, it delves into unbelievable scenarios long before the wormhole scene. Not to mention a boring final interaction which completely destroys the two hours of buildup that came before. Jodie Foster holds up well enough and Zemekis is as great as ever. It's pretty clear at this point, McConaughey hadn't found his true and later talent yet, and all we get in the same as all his romantic comedies of the era.